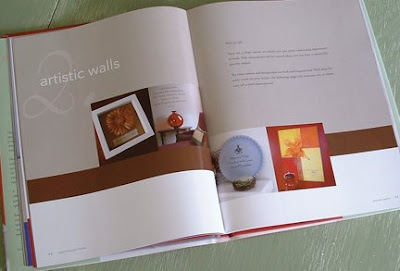 Inspiring Ideas with artist Jeanne Winters: Win a Book - Contest Giveaway!! Win a Book - Contest Giveaway!! Announcing ... Inspiring Ideas first contest giveaway!! 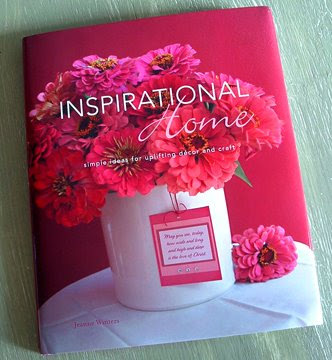 I will be giving away 2 copies of my book Inspirational Home: simple ideas for uplifting decor and craft! This is a hardcover book packed with big color photos of unique ideas you can easily make yourself. To enter, just post a comment here telling me your favorite idea from my blog AND/OR become an email subscriber. Bonus - you can be entered twice if you do both! I post about once a week. Of course, you are free to unsubscribe after the contest if you wish. No purchase necessary since I'm not selling anything. Contest ends at midnight Mountain Time on May 10, 2008. I will draw two names on May 11th (in honor of mothers everywhere) and post the winners shortly after. US residents only. Be sure you leave your email in the comment so I can also contact the winners for shipping information. Naturally, I will pay postage. Please spread the word. Thanks and hope you win!! I'd love to win a copy of your book. Please enter me. I am entering your contest to win the beautiful book. My fav ideas on your blog are really all of them! I love the cross on the vase... the jeweled one on the leather and also the little wired one. I love the picture frame, the Easter ideas... ALL OF THEM! LOL! Thank you for giving us a chance to win your book! Pick me, pick me. I would love to win your book, it looks to pretty and the cover would match just about everything in my life. My favorite is the wire cross on the vase. 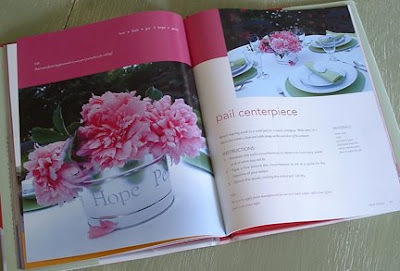 I love simple inexpensive ideas that spruce up something ordinary. I've been to Monteray, CA. It's so beautiful. And cruised down the same hwy down by pepple beach. I hope to go back there someday. Hi! Thank you for this opportunity! I think my favorite idea on your blog is the little Easter Egg Place Cards..just LOVE THEM! I also signed up for your email subscription. Blessings, Penny, Miss Pootsie's Primitives. I hope I win your beautiful book. Thank you for the chance. I like your decoupage photo frame with Bible verse idea. Just the pictures on your site are inspirational. I would be delighted to subscribe to your newsletter. There is nothing I enjoy better than making my home a warm & cozy haven for my family. My favorite idea on your site is the Mother's Day bouquet with the magnet. That's such a neat idea to use that as the tag and then she'll have something to keep. Cute! I liked the post on The Fresh Spring Idea. I left you a comment there, but I'll tell you that I just love the beauty of simplicity. Couple that with hydrangeas and that did it for me. This is so easy to do. Even I can do it, and I'm nowhere close to being a good decorator let alone a great one. I definitely could use some hints and tips from your book. Enter me please. Thanks. I love your Faith Hope Love flower buckets. Those are great. I'd love to have a copy of the book. I'm always making things, some new ideas would be wonderful! I would love to add a little more personal decor to my home. Would love to have a copy of your book. I am going to do the vase from a banquet to Mom. I love making magnets and never though to put them on a metal vase..Can't wait. 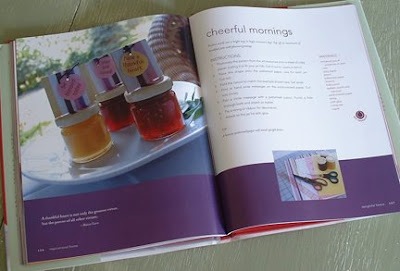 I just discovered your beautiful blog and your book looks lovely! I just found your beautiful blog through the CWO blogroll. I LOVE the faith, hope and love buckets. I'm adding you to a favorite on my blog. Stenciling "Faith," "Hope" and "Love" on a trio of buckets is a neat idea. I love to make things, the stencils are a great idea!! I love the may day basket! I love the bright pink, orange, & yellow colors of it. Count me in to win the book Inspirational Home! Oooo, another craft site I've come across. I really like the stenciling on pails, and the cards attached to them. I will be a regular visitor to your blog! Hello: I saw your post on another site and popped in to see your beautiful designs. Signed up for your newsletter. I am always looking for new design ideas. I would be honored to be entered into your contest. That book looks incredible! I love craft ideas! I liked your posts of the Bouquet for Mom and Celebrate May Day. I love giving and receiving flowers and as a child, I was always picking flowers (and weeds!) for my mom. Hi, I love your blog. I accidently came across it looking for recipes for houseguests. I love the Icthus wall art you designed. I came across it on Dayspring's site when I was sending a Dayspring inspirational video to a friend of mine who's son was paralyzed this past fall in a car accident. I would love to win it and send it their way. They could really use the inspiration it brings. Love your blog and plan to share it with my friends and family. Thanks for sharing your ideas with all of us!